Mike Wells Official Website: Listen to 3 Bestselling Audiobooks by Mike Wells FREE! 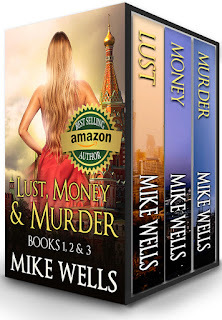 Listen to 3 Bestselling Audiobooks by Mike Wells FREE! All my audiobook series are narrated by experienced, professional voice artists. You can listen to Book 1 of each series free on SoundCloud. The first three below are free listens! Listen to Book 1 Free! One spectacular financial scheme. One woman alone against the world. Young, beautiful, and yearning for love, Heather Bancroft meets the "perfect" man...and loses all that is dear to her. Heather's thirst for revenge takes her halfway around the globe--she's playing for the highest stakes in a lethal game. Only one man loves her - he's just as determined as she is. And one man wants her dead. I think it's a great idea. In fact I'd love to connect with the producers as a reader. This is great. I agree with you. I started listening to audiobooks because I my work commute, but I still read books as well. It's actually given me a chance to soak up more books than ever before without having to put other things aside because I don't want to put my book down. My younger sister was never a reader. Just hated reading. But she started a wallpaper company, which is a lot of repetitive work, so she started listening to audiobooks. She loves them. Now she keeps up on all the current books. I have listened to one before, but was not to impressed. I think it was the narrator. Thanks for this post. I would LOVE to put my novels on audio. I just haven't found a way yet that I can afford, and since I've listened to a few audio books where the voices just totally turned me off the book, I know I'd like it done well. How did you go about it? t never hurts to offer a book in another medium. I'm thinking of doing an audio book for my first novel. Just haven't fiured out how to do it. Thanks for sharing your thoughts!! Audio books are also necessary for people who are blind, or have poor sight. I used to read newspapers for the blind and many of the people I met bought audio books. They may not have been able to read a novel in the traditions sense, but that shouldn't, and didn't, stop them from listening to a novel. For me that would be a good reason to have my novels made into audio books. Late last year and earlier this year, I had two cataract operations within six months and, being an avid reader, relied on audiobooks to keep me going. They were my lifeline as they are to a friend who is registered blind. Thanks so much for that, Carissa - I will add it to my post. You are spot on about hands-free, eyes-free being an advantage, I love to listen to audio books whilst stitching & cardmaking or in the background whilst I'm baking or doing housework. I find it stops my mind wandering (worrying) too. An excellent narrator is so important though as even the best book can be ruined by a bad narration! I absolutely love audio books and completely agree that the narrator can make or break the story. I would love to narrate but have no idea where to even start. Any advice? I love audiobooks. There are health reasons besides poor eyesight or blindness that lead some to audiobooks. For me, that reason is Rheumatoid Arthritis. Holding real books is impossible some days. Due to RA and other forms of Arthritis, I can't move around as much as I want to, and sitting for long periods of time is very difficult for me to do. I've always needed to be engaged in more ways than one. So I stitch, hand quilt and cross stitch on the days I can. On the days I'm unable to do one of these activities, I game. But always with an audiobook keeping me company. The narrator certainly does make or break a book. I've had to give up on books I've wanted desperately to 'read' simply because the narrator was so bad. I belong to 2 audio sites and I borrow Audiobooks from Hoopladigital.com and Cloud library which my local library offers. I can't physically go out to the library, and I'm so grateful to live in an age where we have digital accessibility. Thanks to Mike for this thread, I would not think it would be an issue. As long as people are reading, no matter how, is all that should matter as far as I am concerned. Thanks so much for your insightful and well-written comments, Ila. That's a new reason for reading audiobooks that I have never heard befor- I can certainly understand the benefit. Take care.